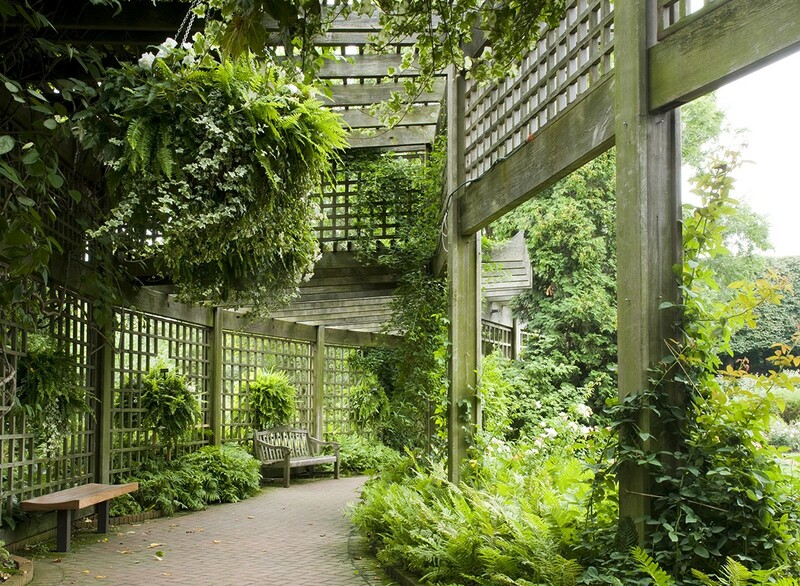 The Krasberg Rose Garden’s arbor is the perfect place to pause on a romantic stroll. “Something borrowed, something blue…” sets the tone in the English Walled Garden. 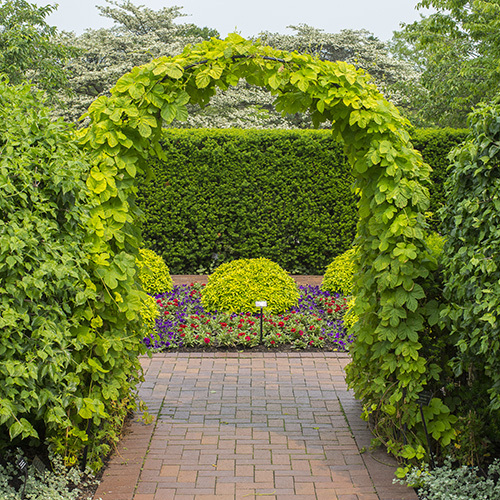 With climbing hydrangeas overhead, a pergola of white wisteria just ahead, and a romantic morning glory tile inset behind you (are those leaves or hearts? 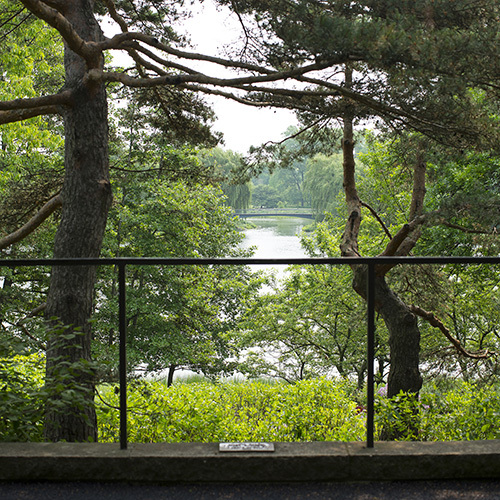 ), the vividly blue bench tucked into the niche at the English Walled Garden is the prettiest seat at the Garden. On summer evenings, the bridges to Evening Island—the Arch Bridge and the Serpentine Bridge—are lit at night. A bridge is such a splendid place for a private conversation and…reflection. The dramatically lit Serpentine Bridge is the path to summer evening romance. The top of the Waterfall Garden has it all: rushing water, a sweet arbor, birds chirping in shady trees. 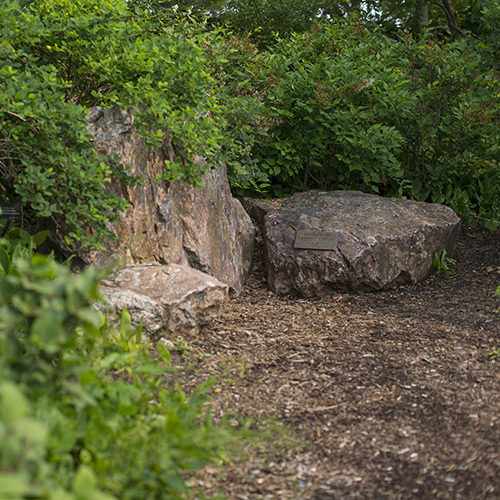 It’s one of the best spots at the Garden to sit…very…close. The peaceful hideaway atop the Waterfall Garden is a romantic destination in any season. Romantic memories need a great background. At the top of the Sensory Garden is the photo-worthy frame you’re looking for. 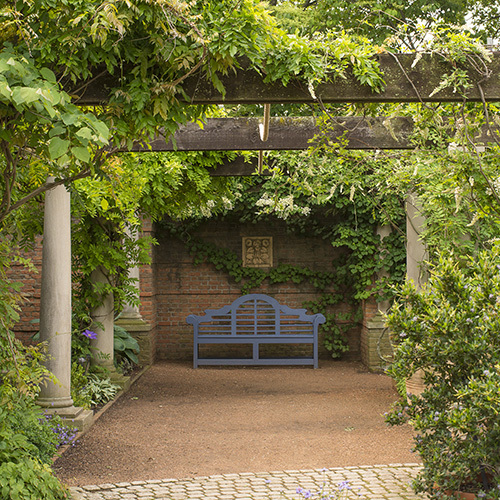 Tucked away in the Sensory Garden is this shady arbor, ready for a romantic moment. A shoreline chorus is the perfect accompaniment to your proposal at the Cove. On Monday nights, carillonneurs from around the globe transform Evening Island into an outdoor concert hall. Not coincidentally, it’s also picnic night. Got the picture? A romantic picnic, the music of bells, and a secluded spot on Evening Island, where two perfectly placed rocks make a perfect seat for a perfect couple. Enjoy a concert for two on Monday nights from this secret spot on Evening Island. 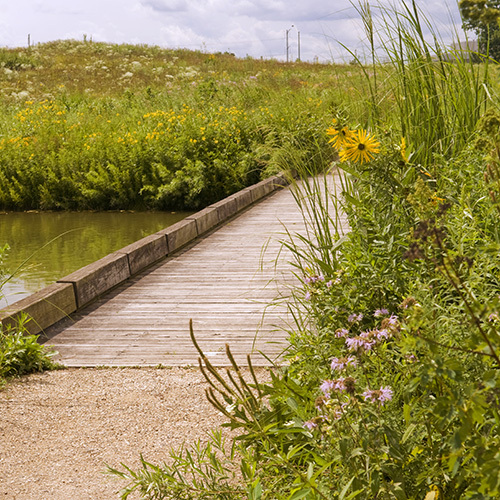 A summer walk through the Dixon Prairie is inherently romantic, with grasses and prairie flowers taller than your head, and late-day light filtering through the foliage. Take the boardwalk bridge across the water to tiny Marsh Island for a memorable sunset moment. Prairie plants grow tall enough to hide stolen kisses off the beaten path on Marsh Island. Pop the question in one of the side gardens of the Circle Garden for a “hoppy” answer! 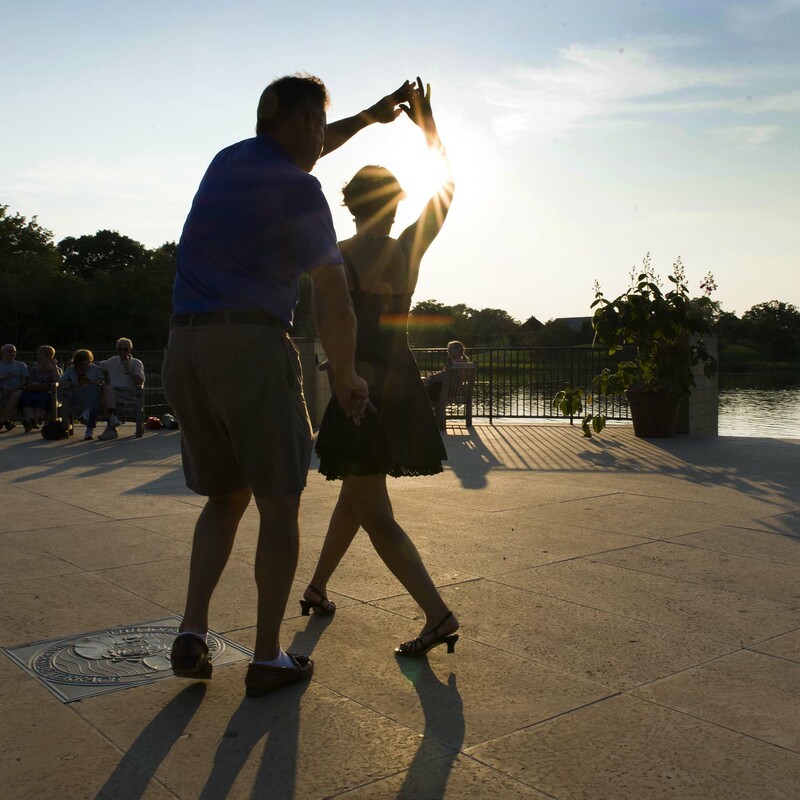 Pop the question after a sunset samba on the dance floor with the best view in town: the Esplanade. Dancing is romantic. Outdoor dancing is super romantic. Outdoor dancing at the Garden is meta romantic. And it happens every weeknight during the summer. Salsa, swing, big band, bluegrass, and jazz rock the most beautiful “dance floor” in town. Wonderful weddings happen at the Garden. 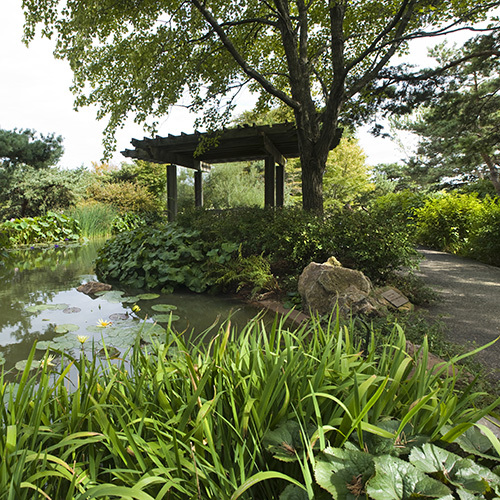 Find out more from Connie or Kristina at events@chicagobotanic.org. called the Pepper Pot. Great addition to our list!